The Emerald Coast Post of the Society of American Military Engineers (SAME) recently held their 4th Annual SAME ECP Clay Shoot at the Santa Rosa Shooting Center in Pace, FL. NOVA was excited to participate in this great fundraiser which provides scholarship funding for the organization. We invited Mott MacDonald, an engineering and development consultancy, as our guests and they ended up taking 2nd place. 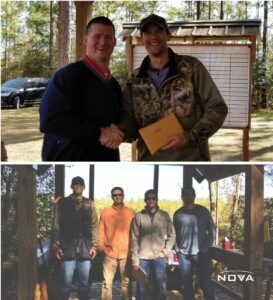 In addition, Stephen Shattuck, a Staff Engineer in our Pensacola office was the 2nd highest shooter at the event. A great day was had by all.